Senator RIchard Blumenthal spoke to the League of Women Voters June 1 at the New Canaan Country Club. 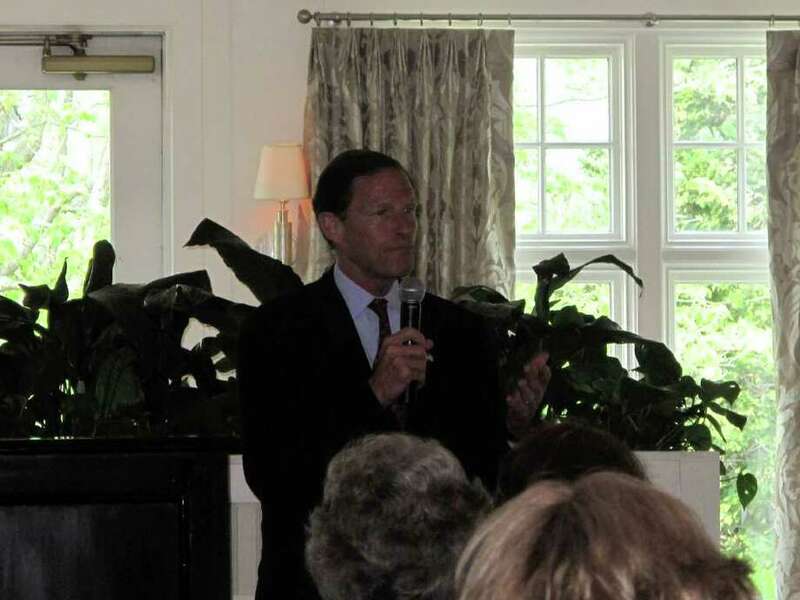 Five months into a job he has been after for quite some time, Senator Richard Blumenthal arrived at the New Canaan Country Club eager to share his experience as a "rookie" with New Canaan's League of Women Voters June 1. "As many of you know, I was attorney general for 20 years," Blumenthal said to the crowd. "I have been a United States Senator for all of five months. So you're under no illusions, I am the junior United States Senator among 100 U.S. Senators. In seniority, I am number 97. ... So really, any day I get a chance to speak is a good day for me." As he got into the less lighthearted portions of his speech, Blumenthal commented on the issues like partisan behavior, women's healthcare and the treatment of United States veterans. Blumenthal shared that he found Congress and government in general to be more divided than he anticipated. He explained when it comes to preventive health care, jobs and the debt ceiling, everyone should work hard to tackle these issues in a bipartisan manner. Particularly in regard to healthcare for women, Blumenthal has some firm viewpoints. "I think there ought to be bipartisan agreement that certain kinds of health care are an obligation of this country. Certain kinds of preventive health care," he said. "It makes no sense, none, to defund Planned Parenthood." Planned Parenthood, a sexual and reproductive health care provider that also happens to perform abortions, has come under fire recently by pro-life advocates who believe federal funding for an organization that can perform abortions is not right. It is important to note that while federal funds have gone to Planned Parenthood, those funds do not go toward abortion procedures. "Only a small fraction of the work that Planned Parenthood does concerns abortion," Blumenthal explained. "The vast majority of the services they provide are basically cancer screening, preventive health care, prenatal care. All kinds of activity that saves us money... If you want to save money, invest in preventive care and that is what Planned Parenthood does and that's what this kind of health care does." Blumenthal stressed the importance of preventive care in regard to keeping people healthy and making the medical system more efficient. He explained the problem some hospitals have had in failing to put in place thorough rehabilitation measures to stop patients from coming back in for the same issues again and again. However, he highlighted several hospitals in Connecticut that have increased their efforts in that arena. "We ought to be very proud of some of the hospitals in the state of Connecticut because they recognize this problem and they are acting on it," he said. "St. Vincent's, for example, in Bridgeport, Yale New Haven, Hartford Hospital, have plans to eliminate mistakes and to forge partnerships with preventive health care experts so that they can save money as well as save lives." In addition to women's health care, Blumenthal is very passionate about treatment and benefits for veterans in this country. In fact, he told New Canaanites it was perhaps the most important thing he would say to them. "This country is failing its veterans," he said bluntly. "Tonight, in this country, the greatest country in the history of the world, about 100,000 veterans will be homeless. Double that number over the course of the year. Of the veterans coming home from Iraq and Afghanistan, veterans in their twenties getting out now, every one in four is unemployed. Think of it, 27 percent unemployment rate for veterans in their twenties today. ...That is double the rate of their peers. You are less likely to have a job today in the United States of America if you serve your country in the military. You are one half as likely." In response to this problem, Blumenthal has proposed a bill along with other senators and congressman called "Honoring all veterans," which he hopes will be adopted in some way very soon. At the end of his speech, Blumenthal took several written questions from the audience concerning job creation in Connecticut, bipartisanship and foreign affairs. Regarding his focus on Connecticut and working with his fellow governing officials in the state, Blumenthal stressed the nature of his job. He explained how he comes back to Connecticut every weekend if not more frequently to stay close to the issues key to Connecticut. In addition to physically being here, he described how he has constant communication with people like Jim Himes and Governor Dannel P. Malloy regarding job creation and investing in the right areas to ensure more opportunities in state. Another question posed to Blumenthal had to do with the United States' dependence on foreign oil, other alternative energy sources available and the Department of Energy's performance or lack thereof on those matters. "I have been critical of the energy department in the ways that it has spent its money," he said. "I think that they have failed to do enough. I'll give you an example that is very close to home, on fuel cells. Connecticut is the fuel cell capital of the United States. ... We produce more fuel cells than any other state. Fuel cells can be used by the military in places where otherwise they would have to deliver gasoline. One of the biggest costs of these wars we're conducting is simply getting the fuel out there." At the end of the event, Blumenthal praised New Canaanites and the League of Women Voters for asking him tough questions and encouraged more of their input in the future. He said he believes hearing from his constituents is perhaps his most valuable asset. "I have found during my time in public office the most important thing I do is really listen to people. There is an old saying, you've heard it, that God gave us two ears and one mouth so may we do a little more listening than talking, which I think is a responsibility that most officials forget. My best ideas, my best energy has come from being with people."